For this exercise, the EAS (Puerto Rico and US Virgin Island) system will be activated through the following communication means: radio, T.V., cable TV and NOAA radio. The real alert code of tsunamis, TWS, will be used during the exercise. This message will be issued around 10:30 AM on March 14, 2019, by the National Weather Service (San Juan Forecast Office) to announce the Tsunami Warning for Puerto Rico, according to the determined scenario for the exercise. The EAS activation is a way used to verify that in a critical real situation the different communication means will be available to inform the community. It is important to clarify that the PRSN is NOT authorized to issue this product, therefore, this issuance is coordinated by the PREMA (for Puerto Rico) or VITEMA (for US Virgin Islands) and the National Weather Service (San Juan Forecast Office) and has been authorized by the FCC. EAS-PR is activated in coordination with the Puerto Rico Broadcast Association. In case of a real event, the EAS is activated on the first message for WARNING/ADVISORY/WATCH of a tsunami for Puerto Rico. 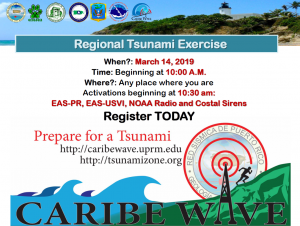 Coastal municipalities recognized as Tsunami Ready, are encouraged to test their emergency sirens during the CARIBE WAVE 2019 exercise at 10:30 am. We encourage the general community to stay alert to the activation of the Coastal Sirens and EAS system on March 14, 2019 as part of the CARIBE WAVE 2019 exercise. 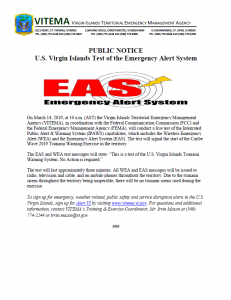 Download the EAS Virgin Island Public Notice by clicking on the image. 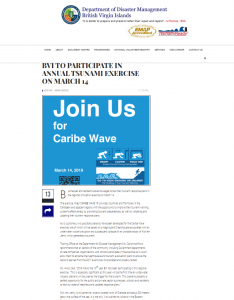 Download the Caribe Wave Press Release by clicking on the image. Access the Publication of the Department of Disaster Managemenet BVI by clicking on the image. 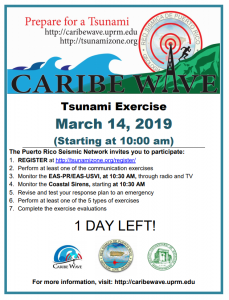 On March 14 will take place the Tsunami Exercise, CARIBE WAVE 2019, starting at 10:00 a.m.. This exercise has as objectives: evaluating the communication systems between emergency agencies, and promoting the preparation of the community before a tsunami. To register as a participant and receive more information, visit our website: caribewave.uprm.edu. Public service message sponsored by the Association of Broadcasters of Puerto Rico. * Currently the radio guidelines are being broadcast by the radio stations affiliated to the Association of Broadcasters of Puerto Rico as a public service. 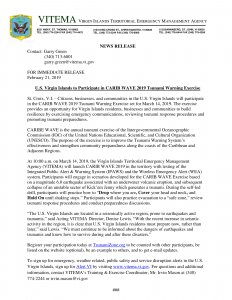 (insert community/county/state name) will join other localities in the Caribbean as a participant in a tsunami response exercise on March 14, 2019. The purpose of this exercise is to evaluate national and local tsunami response plans, increase tsunami preparedness, and improve coordination throughout the region. This exercise includes two scenarios, one of which is of volcanic origin. The exercise, titled CARIBE WAVE 19, will simulate a widespread Tsunami Threat situation throughout the Caribbean, which requires implementation of local tsunami response, plans. The exercise will (insert “include” or “not include”) public notification. The exercise will simulate (insert description of chosen scenario – source and appropriate local time) on March 14, 2019. A handbook has been prepared which describes the scenarios and contains tsunami messages from the Pacific Tsunami Warning Center (PTWC). The PTWC is the Regional Tsunami Service Provider for the other countries in the Caribbean Sea and Adjacent Regions. Insert paragraph tailored for specific community. Could identify participating agencies and specific plans. Could describe current early warning program, past tsunami exercises (if any), ongoing mitigation and public education programs, etc. Could describe tsunami threat, history of tsunami hazards, if any. The exercise is sponsored by the UNESCO/IOC Intergovernmental Coordination Group for Tsunami and Other Coastal Hazards Warning System for the Caribbean and Adjacent Regions (ICG/CARIBE-EWS), the Caribbean Emergency Management Agency (CDEMA), the Centro de Coordinación para la Prevención de los Desastres Naturales en América Central (CEPREDENAC), EMIZ Antilles and the U.S. National Oceanic and Atmospheric Administration (NOAA). For more information on the U.S. tsunami warning system, see www.tsunami.gov. For more information on the ICG/CARIBE-EWS, see http://ioc-tsunami.org/index.php?option=com_oe&task=viewEventRecord&eventID=1912. Click on the following images to download the advertisement in PDF format.